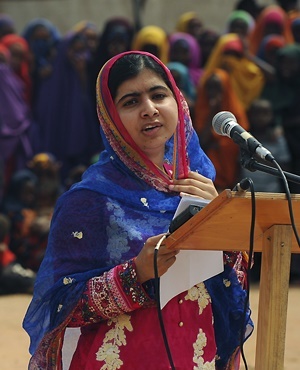 Nobel laureate Malala Yousafzai has arrived at a camp for Burundian refugees to encourage the girls there to pursue their education despite the challenges they face. The 19-year-old advocate for girls' education was visiting the camp in Rwanda on Thursday after touring the world's largest refugee camp earlier this week in Kenya. The refugees in the Mahama camp in Rwanda have fled the ongoing turmoil in neighbouring Burundi, where President Pierre Nkurunziza's decision last year to pursue another term led to protests and killings. Peace talks were reported to be stalled this week. The camp holds more than 48 000 refugees. Rwanda's government recently provided more land to double the space available for them. Malala also met with Rwanda's president on Wednesday.